One of the basic materials of human civilization, wood still plays a central role in 21st-century life. It's used in home construction and furnishing, in transportation, and in the manufacturing of countless consumer products. It's also used, in the form of wood pulp (a fibrous material made from processed wood chips), to produce paper, paper products, and fabric. And in large parts of the world, particularly in Africa, wood remains an important source of fuel for cooking and heating. Unfortunately, wood is also a major driver of deforestation. In the countries that account for most of the deforestation caused by the four biggest drivers, wood products contribute about 10 percent of the total. But because wood is used in so many different ways, the relationship between wood products and deforestation is complicated. Some wood products, such as fuelwood and timber, largely drive forest degradation—which is often the precursor to deforestation. Others, such as pulp and paper, may come from deforestation in Southeast Asia or from plantation forests around the world. And while some wood products can be traced back to unsustainable sources, well-managed wood is a renewable resource. Much of the wood we use comes from plantation forests, but a significant portion of it is extracted from natural forests. About a third of wood extracted from natural forests worldwide is used for timber products. In Southeast Asia, particularly Indonesia, timber harvesting is a direct driver of forest clearance; after forests are cleared for timber, these areas may be converted into wood plantations. But for the most part, the use of wood for timber or fuel drives forest degradation, in which forests are thinned and some carbon is lost, as opposed to deforestation, where the entire forested landscape is lost. 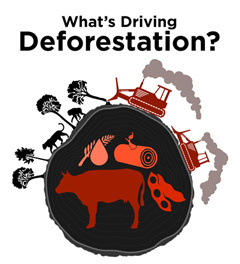 Though much more common than deforestation, forest degradation has a smaller overall global warming impact. Timber production drives forest degradation through selective logging, where the more valuable tree species are removed from the forest. In most tropical forests outside Southeast Asia, less than 10% of the volume of the trees in the forest is valuable as timber, and harvested forests retain most of their carbon and their biodiversity. Yet selective logging can be more damaging than it sounds. It can have an outsized impact on the surrounding ecosystem: the selective logging of one tree can damage 10 to 20 surrounding trees. Selective logging also makes a forest more vulnerable to fire and other threats, and may change its suitability as habitat for some species. 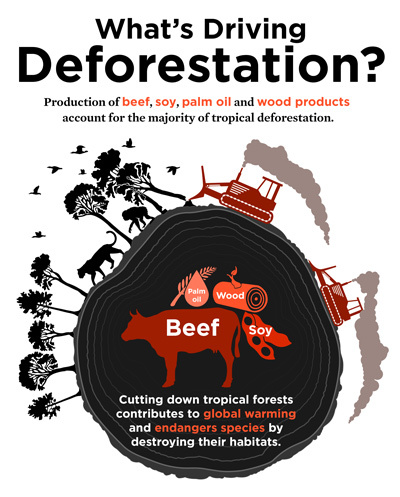 Selective logging can also be a first step toward deforestation: degraded forests are more likely than intact forests to be targeted for conversion to other uses, such as palm oil in Southeast Asia or soy or beef in Latin America. Fuelwood use by small farmers in developing countries is sometimes cited as a major deforestation driver, but recent research suggests that this is not the case. While fuelwood constitutes more than half of the wood extracted from natural forests, it mostly drives degradation rather than deforestation—except in the case of charcoal, which represents a small fraction of the total. Like soy, beef, and timber (and unlike palm oil), paper is not exclusively produced in the tropics. In fact, the three biggest paper-producing countries (the United States, Canada, and China) are all in temperate regions. But tropical countries have become an important source of pulp and paper, thanks in large part to their year-round growing season and lower business costs. Brazil and Indonesia are the largest pulp-producing countries in the tropics, but they play very different roles when it comes to deforestation. In Brazil, paper plantations tend to occupy former pasture land, so they have relatively little direct deforestation impact. In Indonesia, on the other hand, the drive for wood pulp has led to the destruction of forests to make way for new plantations of "fast wood" such as acacia. In fact, between 2000 and 2010, clearing forests for fastwood plantations in Indonesia accounted for more deforestation than palm oil or coal mining. This is particularly harmful because about a quarter of fastwood plantations were cleared on carbon-rich peat soils, adding significantly to global warming pollution. Wood production doesn’t have to mean deforestation. About 30% of the world’s forests are production forests, designated to provide wood, fiber, energy, and non-timber forest products—though not all are harvested sustainably. And while wood plantations have been a major deforestation driver in Southeast Asia, they don’t have to be. When they replace pasture or agriculture, they can support increased carbon storage and biodiversity—though they fall well short of natural forests on both counts. And plantations are more efficient than natural forests, producing 3 to 10 times more usable wood. Certification systems, such as the Forest Stewardship Council (FSC) or the Programme for the Endorsement of Forest Certification (PEFC), cover both timber and paper products. These certifications provide assurance to consumers that the wood used in their purchases meets ecological, economic and social standards—though as of 2012, only 2 percent of tropical forests were certified. In addition, a number of countries—including the United States—have passed laws prohibiting the sale of any plant obtained illegally. While the Lacey act, as the U.S. law is known, has coincided with declines in exports of illegally sourced wood fiber to the U.S., it's unclear whether rates of illegal logging have actually decreased or whether illegal producers have simply moved away from the U.S. market. 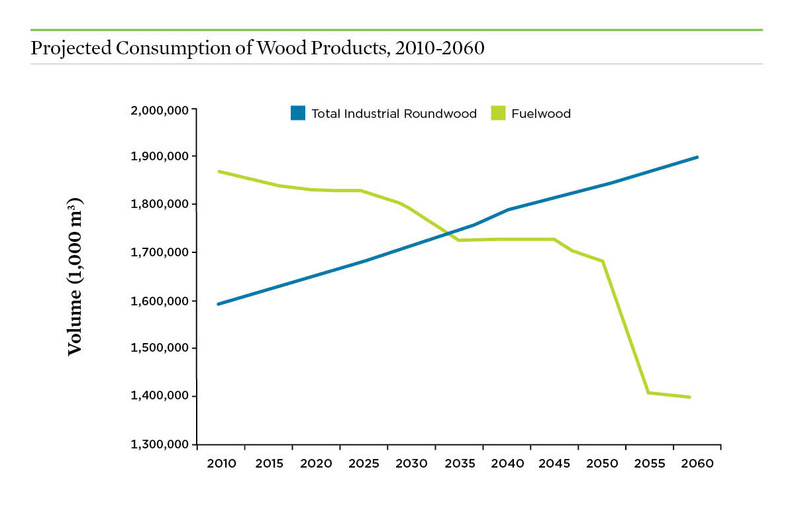 While fuelwood consumption is expected to plummet over the next half-century, demand for industrial roundwood (which includes both timber and pulp) is expected to increase steadily. 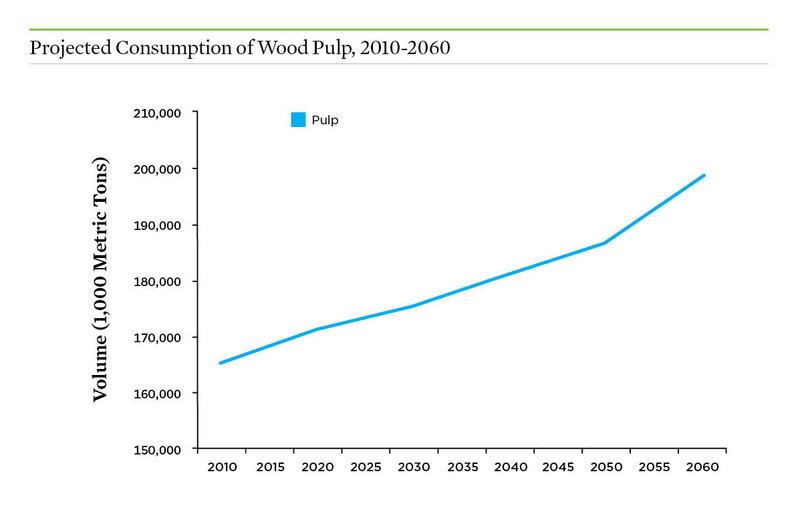 Increasing demand for pulp will accelerate around mid-century, according to projections. While fuelwood consumption is actually projected to decrease over coming decades, timber and pulp consumption will continue to climb. To prevent this rising demand from contributing to global warming and biodiversity loss, we need to ensure that wood production is not linked to deforestation or forest degradation. Plantation forest area for both timber and paper has been increasing worldwide, and now accounts for 7 percent of the world's total forested area—over 290 million hectares—with more than 3 million hectares added each year. While only about 15% of harvested wood is currently used for pulp, this percentage is likely to increase, as demand is expected to grow more quickly for pulp and paper than for other wood uses. By 2060, all types of paper consumption are predicted to at least double, and in some cases almost triple. The use of recycled paper, non-wood fibers, and waste wood in paper production can allow for meeting the world's paper product needs while using fewer trees. More than half of the fiber currently used to make paper does not come from virgin forests; continuing this trend will be crucial to ensure that rising global demand for paper does not drive increasing deforestation.